You can only play in teams as it can’t be played individually. All members of the team must have a battle pass. The members of the team must at least be level 27, therefore, before playing they will have to complete weekly challenges. Once these three requirements have been met, we can download the golf toy that works just like emotes and dances but, unlike the latter, it generates physical objects that we can interact with. In other words, we’ll generate a golf ball that we can hit with a pick. However, it’s quite hard to master. Once we can use the golf toy, we’ll have to travel to Lazy Links on the map, which has recently replaced Anarchy Acres. Here we can find a golf course with special holes that make sounds and launch confetti each time we get the ball in. We’ll be able to play with our friends here, but it’s not the only place: the truth is that we can play all over the map but this is the only location with special sounds and effects such as the confetti. By the way, we’ll have to keep our scorecards manually because the game doesn’t register them. 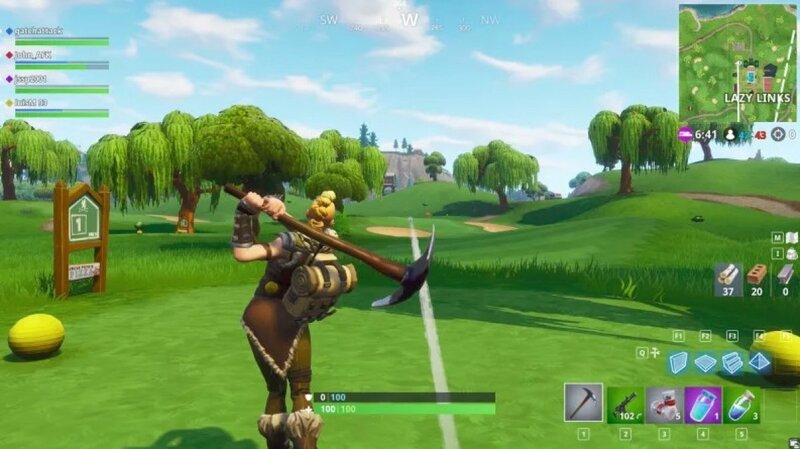 To play golf, the best way to do so is in the Playground mode but sometimes it’s down due to improvements being carried out by Epic Games, therefore, we’ll have to try to take control of Lazy Links so that nobody interrupts us. This golfing functions is one of the main updates to Fortnite Season 5, amongst many other changes to the map. What is Fortnite's creative mode? What are Fortnite's balloons and what are they for? What is Fortnite's Port-a-Fortress and what's it for? What is the Fortnite rocket all about?